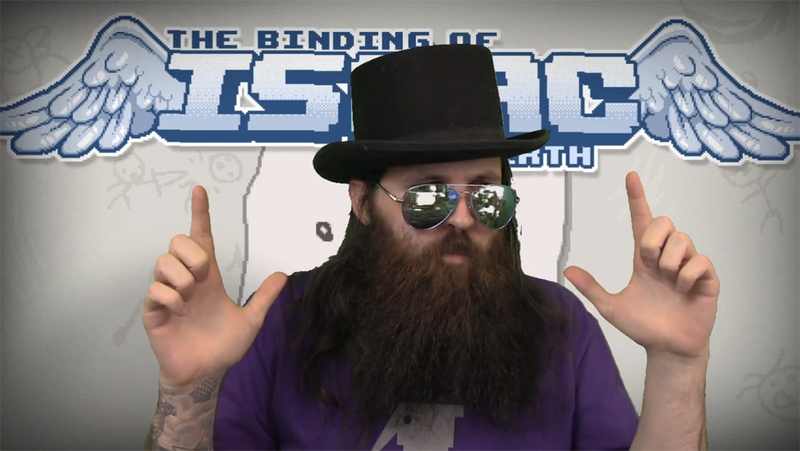 This week The Twitch Review wants to welcome you to the Dapper which is how the man we are taking a look at welcomes new subscribers to his channel. Lethalfrag is a calm streamer who has a welcoming, relaxing, and enjoyable stream. During out review time we saw a few things not seen on other streams done by Lethalfrag. 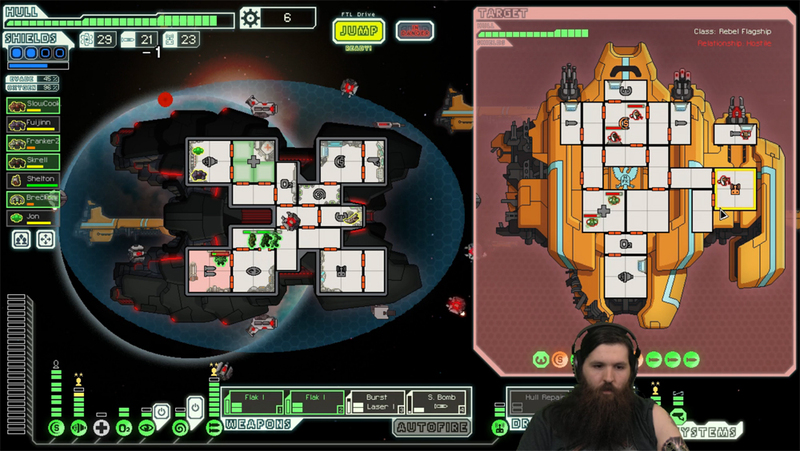 After every victory, whether it be one of his epic Eden runs in The Binding of Isaac: Rebirth or nail biting, one more hit would have killed Lethalfrag, victory in FTL: Faster Than Light, the viewers celebrated Dapper Time. Dapper Time is what he calls his victory celebration which involves Cheese-It’s appearing to come from his beard, a top hat, finger guns, intense glares followed by a nod, and sometimes a ferret or two…or three. Speaking of ferrets, Lethalfrag has several that pop on stream and distract Lethalfrag enough to have become a significant part of the stream; even having their own chat emotes. Sometimes he will pick up one of his ferret and wiggle them a little bit if from of the camera in a fun way. Another unique thing on this channel is that at least once a week the viewer can watch actual pinball being played and sometimes watch the pinball machine be worked on. As far as we’re aware this is the only stream that broadcasts real life pinball on Twitch. Lethalfrag keeps his stream simple. It’s the game he’s playing and him on webcam in a bottom corner of the screen. The games he played during the review time were not the latest releases or the most graphic demanding but they were as crisp and clear as if you were to play them yourself. His webcam picture quality was nice and clear and was never too large or too small. Like many streamers he has a green-screen set-up which cut’s off irrelevant part of video picked-up by the webcam but the settings are not perfect. Frag is cut out from the background fairly well but around the edges you can see tiny bits of green and parts of his headphones get cut off. Generally the webcam image is too small in the corner of a game to really notice but when he addresses his audience at the beginning and end of streams it is easily noticed. To his credit, however, he has been mentioning that he is working on moving the location from which he streams sometime soon and we hope the quality only improves. Aside from the game and webcam quality the sound quality and balance between voice and game were great and consistent and the were no additional sub or donation alert sounds. Lethalfrag does not use donation alerts or on-screen subscription alerts and instead ops to tank each person himself. The is refreshing especially compared to the trends going around Twitch. At the beginning of this review we welcomed you to the Dapper but we didn’t explain what that really meant so let’s go into that now. Lethalfrag says Dapper on his channel means to be nice, respectful, and welcoming to others. Every new subscriber gets an individual welcome to the Dapper from Lethalfrag and with that he’s built a community that we never saw break into actual arguments and always welcomed new people into their community. Other than welcoming subscribers though, he spends most of his time during the stream talking about the game he is playing and sometimes replying to people in chat. It’s rare for Lethalfrag to discuss much outside of what he’s doing in game or topics about the stream itself but that isn’t necessarily a negative. The focus during game play is the game after all and, perhaps aware of how he interacts during games, he has occasional Ask Me Anything, or AMA’s, where he answers questions from viewers. Lethalfrag does a broadcast where he plays games and talks about those games in a focused and simplified way. There are no extra graphics that distract from gameplay and the are no random sounds that play the moment a new person subscribes. If you’re looking for something loud or exciting then this may not what you’re looking for. What we have here is a calm stream that is welcoming and confrontational. A stream like this is perfect to have on while working on other things or when you might want to zone out because there is almost no chance that there will be any sudden outbursts of yelling or loud sounds being played. The Twitch Review recommends Lethalfrag for its calm nature and its focus on the basics and simplicity. If you’d like to check out Lethalfrag for yourself they stream at www.twitch.tv/lethalfrag. Follow The Twitch Review on twitter. 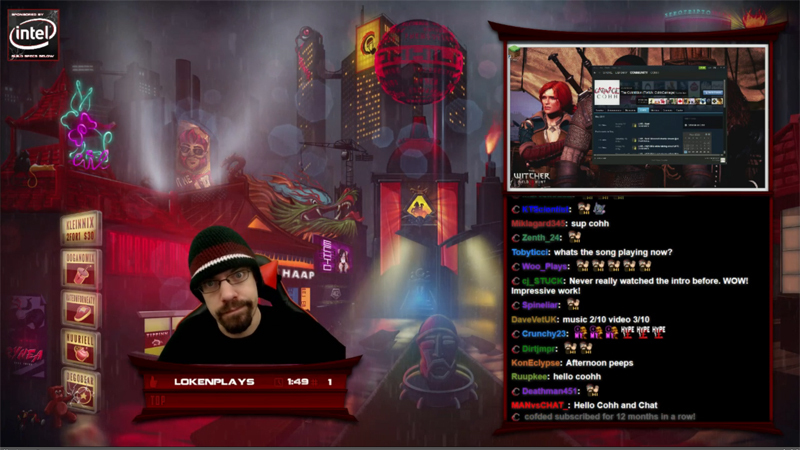 CohhCarnage, a mild tempered man who loves hoarding every item he sees and interacting with as many of his viewers as possible, and his wife Laina, who appears on and off the stream with shows of support and kisses, are the focus for this week’s review. 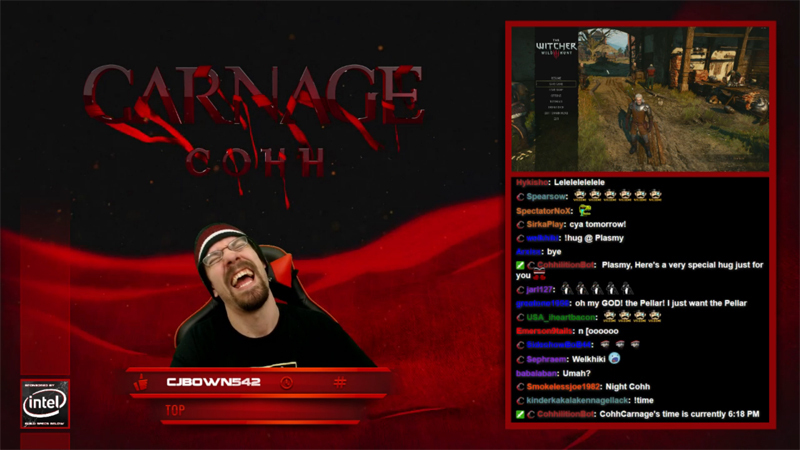 During the review period we saw CohhCarnage, or Cohh, play two very different types of games. He played games like Rust, Arma 3, and H1Z1 where the main focus seemed to be to interact and play with viewers from his stream and he also played Witcher 2 and Witcher 3, both games with heavy story elements, which are single player games where interacting with viewers is difficult. Cohh’s stream was found through Dropped Frames which also featured Ezekiel_III who was the first streamer we reviewed here on the The Twitch Review. We selected Cohh because he felt quite the opposite of Ezekiel in terms of how he dealt with frustration and setbacks in games. While playing Arma 3 Battle Royal Cohh did not scream or rage even after putting a tripmine down in the entrance of a house he thought had two exits only to find that he put the mine at his only way out. He tries his best to disarm the mine but cannot find it to select it and he cannot see it to try to shoot it. Instead of freaking out he goes to the entrance and goes prone and slowly inches forward to the outside in a last ditch effort to free himself from the building. It felt nerve wrecking as everyone watching wondered when the mine would explode. But Cohh actually made it outside safely with no explosions and he plays a little victory sound and smiles saying he figured the mine had glitched out and wouldn’t explode. It was more fun to exit that way he said and he was right. For science is what he says when he says when he tries things out that may or may not work out well. In Witcher 3 Cohh tries to loot everything possible and that leads him to searching every corner and jumping every gap that if he messes up means in-game death. Atop a bridge that’s broken he saw a gap that might be jumpable, you see he quicksaves and says, “for science!”, and jumps and falls to his death. He made it on the second attempt but he may not have not tried at all without his need to test his in-game abilities. The stream isn’t always just Cohh having fun though. Laina pops on and off the stream, often to distract Cohh with kisss and snuggles and cats, and at least once during the review period she sat down a joined Cohh through a Witcher 3 quest full of rats and ghosts. Cohh filled her in with the quest up to that point and Laina taught the viewers how cool rats are as Cohh is attacked by them. The quality of the video on Cohh’s stream is as good as you could reasonable expect on twitch. The games Cohh played always looked like they were on the best quality available, Witcher 3 hair settings aside, and the only drops in frames per second were outside Cohh’s control where his internet service provider was messing up. The webcam on the stream was always on and the quality was nice and clear. 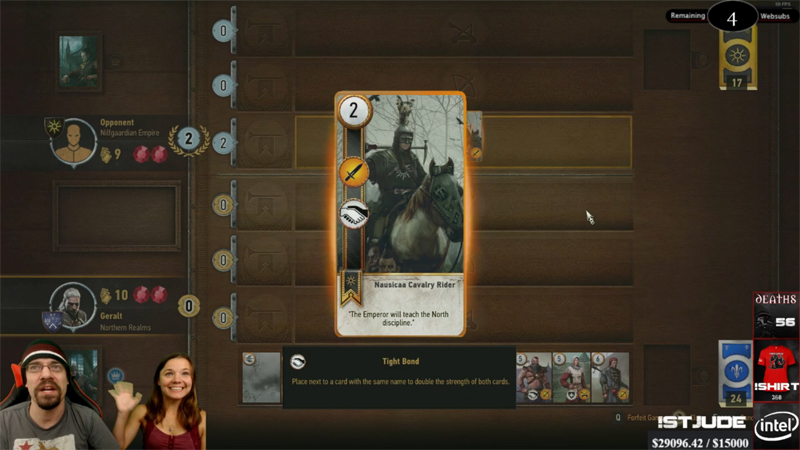 Green screen usage was great and we could not see any errors around the edges of Cohh’s body or even of Laina’s walking around in the background. The layout of the stream was unintrusive with the webcam footage in bottom left or right corner and other information around the edges. The other information included a donation tracker, a sub tracker, a death counter, a t-shirts sold tracker, a sponsor’s logo, a graphic popping in with information about difficulty and platform he was playing on. The information displayed changed depending on the game played and was never obnoxious. In fact, oftentimes the information wasn’t large enough and the viewer might need to put their stream video on fullscreen to see what they said. People watching on mobile device may have trouble seeing or reading the information. Sub alerts were hard to read when they pop up but this isn’t an issue because a little sound clip, “COHHSCRIBER,” plays and if Laina is near-by you’d hear her say, “Good Show!” with a swing of her fist. Cohh then reads off each subscriber and thanks them. The sound quality of the stream was balanced between Cohh’s voice and the game volume nicely and the sub alerts were not overbearing or distracting for the most part as the alert sound was never louder than anything else on the stream. If there was one defining aspect of this stream it would be how focused it is on interacting with the viewers. While many streams are welcoming to new subscribers and try to interact with viewers, not many reach the level we witnessed here on Cohh’s stream. During multiplayer games the focus was always on playing with viewers; even to the point of having a server in Rust just for viewers. 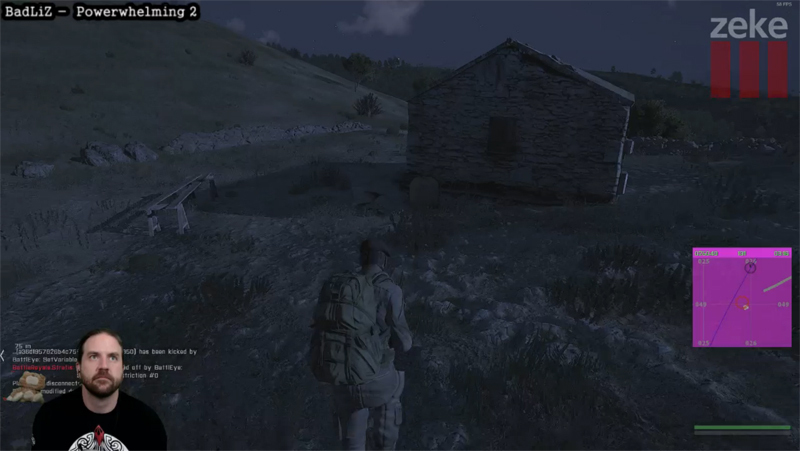 When Cohh died in Arma 3 he wouldn’t leave the server to find a new game. Instead he would spectate the other players and talk with his viewers. More impressive was when he was playing Witcher 3, a game that demands your attention and concentration, which is story drive and single player. Even during a game like that he still managed to be constantly interacting with his viewers, even when there were over 7000 of them. Many times people would ask the same question over and over or if Cohh missed some loot and people yelled at him a thousand times but he didn’t get frustrated and complain about it. Instead he’d just answer the question or acknowledge that he heard he missed something and investigate. The relaxed and understanding nature with a focus on interaction of this stream have lead to a relaxed and understanding community where people are either playing together or are working together to experience the game being played. The overall feeling of the CohhCarnage stream is calm and positive with a focus on community interaction and group experience. Discover together. “For Science,” as Cohh might say. This focus is nice to see. Other good points are in the moments where Cohh may be concentrating hard on the game and Laina pops in in various ways to distract him. The reaction reaction to kisses is reminiscent of a young boy having his cheeks pinched by an overeager aunt who thinks he is just too cute. But his annoyance is only an act and he always response and reciprocates her feelings with kisses back, well wishes, and I love you’s. The stream isn’t perfect for everyone though. If you’re looking for a calm stream with a focus on community interaction and you’re not expecting loud or excitement This stream has many things going for it. Cohh interacts with and plays with viewers in ways we haven’t seen often enough, Laina is a great addition to the stream whenever she pops on adding elements of unpredictability and charm, and, while it can interfere with following story plotlines, it is interesting to see a person doing everything possible in a game in pursuit of that 100% completion. The Twitch Review Loves CohhCarnage. If you’d like to check out CohhCarnage for yourself they stream at http://www.twitch.tv/cohhcarnage. Hello and welcome to the inaugural review from The Twitch Review. 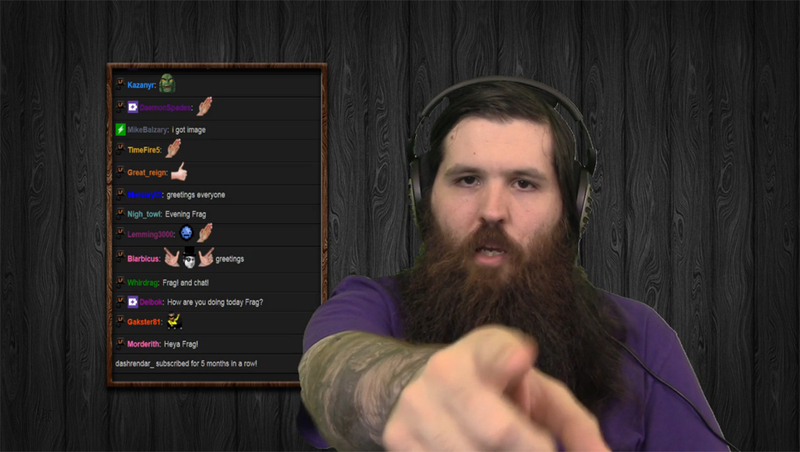 We’re here to find and review streamers on twitch.tv so let’s get right to it. This week we’re taking a look at a hot tempered destroyer of hardware with a heart of pure gold. This streamer is an entertainer who is almost always trying to put on a good and fun show until something goes horribly wrong whatever game he is playing. The streamer was selected for review for his showmanship and for the web of connections he has formed with many other streamers. 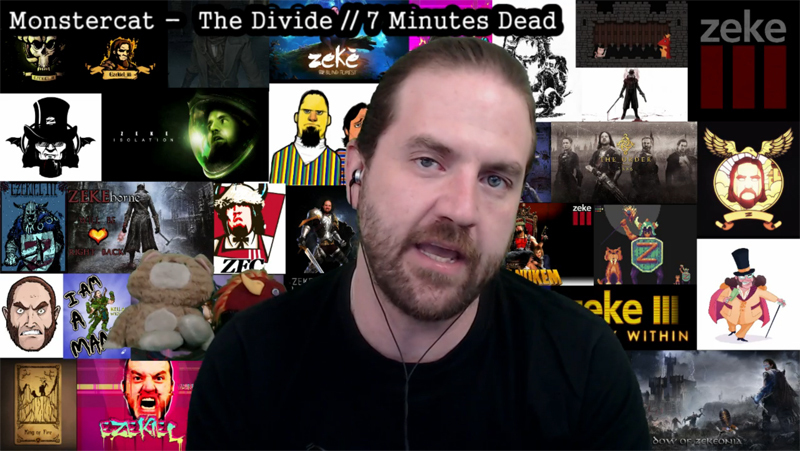 Full disclosure here is that we have watched Ezekiel_III, or Zeke, for several months but for the purposes of this review we are only looking at what was viewed from May 3rd until May 9th; and has Zeke been a busy man. From streaming Dark Souls II to co-hosting Dropped Frames to practicing for an Arma 3 competition to hyping an upcoming charity week, Zeke was streaming all but a single day during the review time. Many of the most memorable things happened during his playthrough of Dark Souls II though. He had a hilarious moment where he was showing off the beauty of his character and making unusual laughing sounds before falling to his death unintentionally(http://www.twitch.tv/ezekiel_iii/v/4703418). Then there was the moment where he was telling his viewers about how he fight by using his head, to yet again fall to his death by mistake(http://www.twitch.tv/ezekiel_iii/v/4716799). And there was also that time when he was using his smarts to try and blow up a cracked wall with a possibly explosive barrel only to completely waste his time(http://www.twitch.tv/ezekiel_iii/v/4717012). In Arma 3 practice he struggled to learn the game but somehow managed to come out second place in a Battle Royal almost without firing his weapons. We also cannot forget to praise Tacorilla and do NOT call his stuffed cat a bear. You’ve been warned. Zeke’s stream consistently has a simple layout that is unobtrusive and is effective. The quality of his webcam video is nice and the lighting works well to light up his face. He uses a green screen relatively well, but sometimes it can be seen bugging out on the edges of his body or in the background. He has a number of backdrops he uses when not playing games including flames when he welcomes new subscribers to his channel. While playing games he puts himself down in a corner and is big enough to see and not not be so big it’s distracting. When playing music he has the song name and the artist name displayed somewhere around the edges of the screen which is a nice touch. When it comes to sound his microphone sounds pretty good and he consistently is able to balance the audio levels between his mic and the game he is playing well and neither were too loud compared to the other. When a new person subscribes to the channel you hear what sounds like a viking horn which leads to Zeke changing his voice with a mixer to be more loud and booming. When he receives a donation it plays a different sound depending on whatever Zeke feels like it should be for the day. The donation sound changed several times over the review period. While at least one never wore out it’s welcome, a weird laughing sound, some of the alert sounds became annoying over time, especially the sounds that were over 2 seconds. Many times Zeke would be talking to his viewers only to be completely interrupted by his donation alert. This stream’s focus seems to be on entertaining the viewers and a mix between fun and excitement with periods of calm with sudden outbursts of rage. Zeke is always interacting with his audience and majority of that interaction is calm and welcoming. He is prone to notice and respond to things females say, but that doesn’t seem to be something intentional. That doesn’t mean he ignores the rest of his viewer and calmly will repeat the same answer over and over if he needs to. Every new subscriber get’s their own special flame filled welcome and every donation is read. Zeke even goes out of his way to thank the lurkers, people who don’t type in chat but watch his stream, with a toast to their support. As a result, the community around the stream feels pleasant and welcoming to new people whether they have subscribed to the channel or not. Even in an open chat, which is becoming less common among popular streamers because of all the negativity and stupidity people can spout, it is overwhelmingly positive. This kind of community is a direct result of how Zeke interacts and talks to his audience. That said though, if also feels like a lot of his community is there just waiting to see Zeke flip out and rage and scream and sometimes break stuff. They’re just waiting for that moment Zeke’s face turns red with anger to laugh at his reactions. It’s similar to Nascar fans who watch in hopes of seeing a wreck. It should be said it’s rare to see Zeke ever rage at anything other than himself and the games he plays. The rage is never directed at his viewers which may be why they wait so eagerly to see the reactions that anger brings, especially when things are broken. Ezekiel_III’s stream comes across as a welcoming channel where you can come relax and have fun with a streamer who will try his best to put on an exciting and fun show. If you enjoy watching somebody get upset and scream when something in his game goes wrong then this stream is going to be great for you. However, if you are more inclined to a fun relaxed stream that inclination may be disrupted when you’re causally watching and Zeke flips out and scares you out of your seat with just how loud he can yell. If screaming and yelling bother you then you may want to try another channel. That’s not to say Zeke isn’t a wonderfully nice streamer who’s best intentions can be smothered by his sometimes over-the-top reaction to frustration. It doesn’t matter that 99% of the stream is fun and positive if that positivity can be turn down with negativity in under a second. Despite that many of his viewers enjoy watching the destruction that comes with the anger, many of the most memorable and fun moments came not when Zeke was upset but when he was laughing and having genuine fun. That insanely weird laughter will still be ringing in people head for a long time to come. The Twitch Review gives a cautious recommendation based on how well you like or don’t like seeing and hearing rage in it’s purest form. The Twitch Review LIKES Ezekiel_III. If you’d like to check out Ezekiel_III for yourself they stream at http://www.twitch.tv/ezekiel_iii.